← 021 "Bart the Daredevil"
"Dear Purveyors of Senseless Violence: I know this may sound silly at first, but I believe that the cartoons you show to our children are influencing their behavior in a negative way. Please try to tone down the psychotic violence in your otherwise fine programming. Yours truly, Marge Simpson." ―Marge's letter to Roger Meyers, Jr. I will not pledge allegiance to Bart. 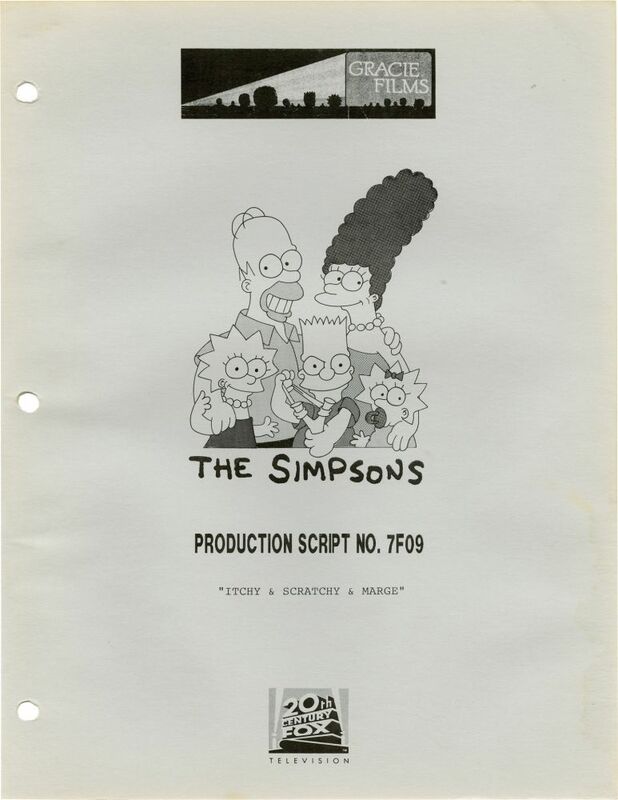 "Itchy & Scratchy & Marge" is twenty-second episode of The Simpsons and the ninth episode of the second season. "After watching an Itchy and Scratchy cartoon, Maggie strikes Homer with a mallet. Horrified, Marge vows to put a stop to violence on children's television. But when the ball of censorship starts to roll, where will it all end?" Homer attempts to build Marge a spice rack. While he is doing so, Maggie sneaks up and hits Homer on the head with a mallet. Marge is at first clueless as to why Maggie would do such a thing, but Maggie sees an episode of The Itchy & Scratchy Show, a cartoon which is known for its violence, and tries to stab Homer with a pencil. Marge immediately blames The Itchy & Scratchy Show for Maggie's actions and bans Bart and Lisa from watching the show. Despite the ban, Bart and Lisa still manage to watch Itchy & Scratchy at friends houses. Marge writes a letter to the producers of the show asking them to tone down their violence and in response, Roger Meyers, Jr. (the CEO of Itchy & Scratchy International) writes a letter to Marge, telling her one person can not make a difference and calls her a "screwball." In response, Marge decides to "show what one screwball can do!" Marge forms "Springfieldians for Nonviolence, Understanding, and Helping" (SNUH) and forces the family to picket outside the Itchy & Scratchy Studios. Unknown to her, Bart and Lisa have been sneaking off to their friend's houses to watch the shows, under the guise of 'playing sports,' or 'making the most of their childhood years.' 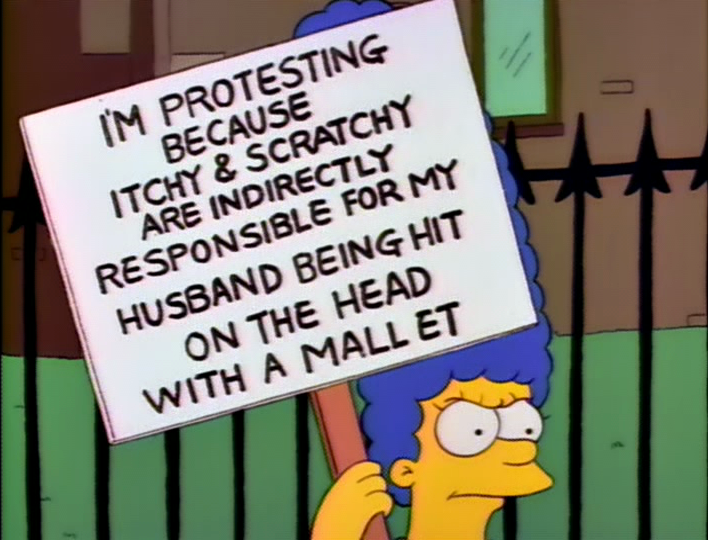 Marge's protest gains momentum and soon more people join the group and even start to picket The Krusty the Clown Show, on which Itchy & Scratchy is shown. Marge appears on Kent Brockman's show, Smartline where she confronts Roger Meyers over the violence and suggests that concerned parents send letters to Meyers. Enough angry letters to fill several trucks are sent to the Studio and Roger Meyers concedes defeat, and agrees to eliminate violence in Itchy & Scratchy. Eventually, the first of the new shorts is released, in which Itchy & Scratchy sit on a porch drinking lemonade. Marge finds the cartoon to be better, but Bart, Lisa, and the other kids across Springfield reject the cleaned-up show. A lengthy montage follows, in which the children of Springfield go outside and engage in various wholesome activities and that night Bart and Lisa brag about their various outdoor activities while Marge listens happily. Meanwhile, Michelangelo's David goes on a coast-to-coast tour of the U.S. and will stop in Springfield. The members of SNUH urge Marge to protest the sculpture, insisting that the sculpture is offensive and unsuitable. However, Marge argues that the sculpture is a masterpiece. Dr. Marvin Monroe argues that Marge is being hypocritical in believing that it wrong to censor one form of art but not another, to which Marge is forced to agree and admits defeat. She decides to give up her anti-cartoon violence protest, although she expresses disappointment that there is no discrimination between centuries-old classic art like David and violent filth meant for the lowest common denominator. Itchy & Scratchy immediately returns to its old form and Springfield's children abandon their wholesome activities. Homer and Marge go to see David and Marge expresses her disappointment that the kids are watching "a cat and mouse disembowel each other" rather than seeing the sculpture. She cheers up when Homer tells her that the school will be forcing them to go. 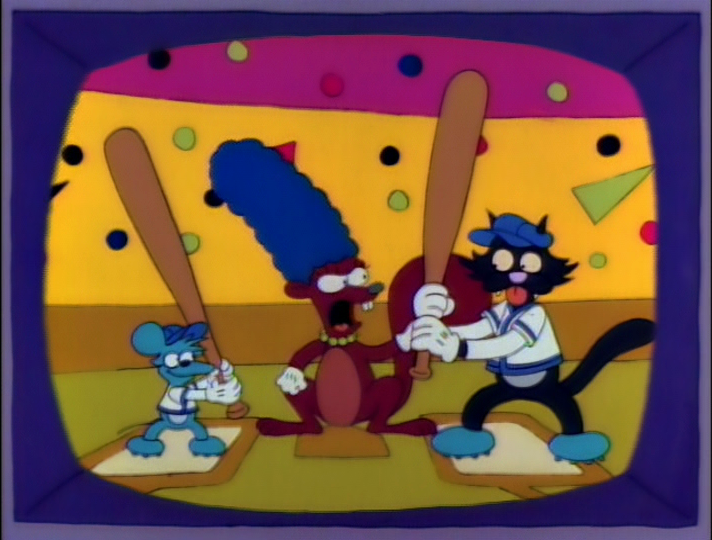 The episode dealt with censorship issues and allowed the writers to have a lot of Itchy & Scratchy cartoons which many fans had been clamoring for. The episode was written by John Swartzwelder, who loved Itchy & Scratchy and wrote several episodes that have them at the center. The episode was partially inspired by activist Terry Rakolta, who protested FOX over the show Married... with Children. For the episode, the writers tried not to have a point of view and looked at both sides of the argument, despite what the writers personally felt. During the original airing of the episode, the Fox satellite blew out and the entire West coast of the United States missed the first act of the episode. This was the first episode directed by Jim Reardon. Reardon had previously made a student film called Bring Me the Head of Charlie Brown, which was very violent which gave him experience to direct this episode. There are several characters who work at I&S studios who are caricatures of real people: the cartoonist who drew the disapproving squirrel is based on Eddie Fitzgerald, who worked at Filmation and the three people with Roger Meyers when he is asking Marge for suggestions are caricatures of Rich Moore, David Silverman and Wes Archer. Alex Rocco makes his first of three appearances as Roger Meyers. Many people behind The Simpsons were huge fans of The Godfather and Jim Reardon looked for a way to shoot him in the eye as a reference to Rocco's character, Moe Greene. The long montage of the Kids of Springfield playing was directed by Bob Anderson and was making a satirical point by saying the opposite of what the writers believed. The segment was written by John Swartzwelder and the idea of using Beethoven's 6th Symphony was in the original script. James L. Brooks had wanted the episode to end with the montage, but the writers disagreed. "Itchy and Scratchy & Marge" was watched by approximately 22.2 million viewers and was the highest-rated show on FOX the week it aired. The episode has received critical acclaim. The A.V Club has since named the episode "a classic." Awarding the episode an A rating, the A.V Club summed up, "[The episode] got to make a relevant point in line with writer John Swartzwelder’s libertarianism without sacrificing the momentum of the episode or losing track of the characters and turning them into mere sounding boards for their creator’s beliefs" and praised the episode for its satire and humor. The Psycho parody has received consistent praise and is considered an iconic reference and hallmark within the series. Total Film ranked the parody at #22 on their list of " "The 50 Greatest Simpsons Movie References"
As of July 2018, the episode has an 8.1 rating on IMDb and an 8.6 rating on TV.com. Wikisimpsons has a collection of images related to "Itchy & Scratchy & Marge". ↑ 1.0 1.1 Jean, Al (2002). Commentary for "Itchy & Scratchy & Marge", in The Simpsons: The Complete Second Season. ↑ 2.0 2.1 2.2 Reiss, Mike (2002). Commentary for "Itchy & Scratchy & Marge", in The Simpsons: The Complete Second Season. ↑ 3.0 3.1 3.2 3.3 3.4 Reardon, Jim (2002). Commentary for "Itchy & Scratchy & Marge", in The Simpsons: The Complete Second Season. ↑ Groening, Matt (2002). Commentary for "Itchy & Scratchy & Marge", in The Simpsons: The Complete Second Season. ↑ Brian Donlon. "NIELSENS; Special help in ABC win", USA Today,, p. 03.D. ↑ A.V Club.com - By Nathan Rabin, Nov 7, 2010 - "The Simpsons (Classic): "Itchy & Scratchy & Marge" - Season 2, Episode 9"
↑ Total Film - By Nathan Ditum, June 6th, 2009 - "The 50 Greatest Simpsons Movie References: Smart and funny riffs on classic cinema moments..."
↑ IMDb - "Itchy & Scratchy & Marge"
↑ TV.com - "Itchy & Scratchy & Marge"
Modified on July 10, 2018, at 14:37.